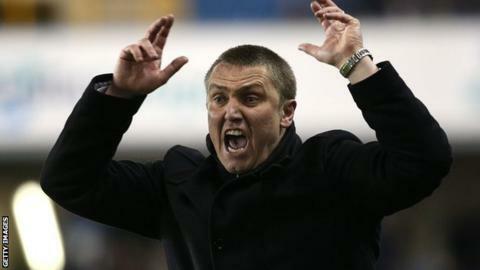 Birmingham City boss Lee Clark says the club's struggle against relegation is hurting him badly but is adamant no-one is sulking about their predicament. The Championship club have lost their last three games and are only above the bottom three on goal difference. "There's too much at stake, I'm not going to sulk - but it's hurting to the pit of my stomach," Clark told BBC WM. "We've got to keep fighting and we've got three games left to get enough points and do what we've got to do." After losing 3-1 at Middlesbrough and narrowly going down 1-0 at Nottingham Forest, they fell apart at home against Blackburn on East Monday, going 4-0 behind at half-time before being beaten 4-2. Blues have not won at St Andrew's since a 4-0 win over Millwall on 1 October 2013. Only bottom-club Yeovil (12) have lost more games at home than Birmingham's 11. Their 14 points from 21 home matches is the worst in the Championship. It was their 11th home defeat of the season and it is now 16 games since they last won on their own pitch. The latest setback was greeting by booing from the Blues supporters but Clark had no complaints. "I don't blame them, they've been brilliant. They don't want to come and spend their money and see the team 4-0 down at home," he said. Birmingham now face back-to-back home games against Leeds and Wigan before finishing the season at Bolton as they try to preserve their Championship status. Meanwhile, work is continuing to secure the club's future off the field. The club's parent company, Birmingham International Holdings Limited, is set to hold more talks on Wednesday over the potential sale of the club. It is believed that as many as five different parties are interested in a possible takeover.